this weekend was so incredibly lovely, i'm surprised that i didn't get sunburned. i got up super early on saturday to hit up some garage sales (my alarm went off at 6:30am, but i'd actually woken up twice before that because i was so excited for my first non-rainy garage-saleing day of the year). we grabbed a coffee and headed off in search for some great discoveries. no spectacularly great finds were found this weekend, however. we did have a chance to meet a sweet old lady named kelly and her husband who were hosting a sale, so we stood and chatted with them about real estate and how lovely the trees were in their neighbourhood for a good twenty minutes. after that, we made a trip to the stouffville flea market where i bought some hand sanitizer. (yeah. i know. par-tay!) it smelled better than the one i was currently using, and the bottle was smaller so i can carry it around in my bag. 24/7 sanitization. sunday was spent pulling weeds from our veggie garden. it's not quite as cool (or big!) as the one in the photo above (which i used only because a shot of a veggie garden without any veggies is just a shot of dirt, which isn't particularly interesting, even if you get all spiritual about it and call it soil or earth). i'll be sure to post a shot when it's a bit more ... populated. this year's crop : tomatoes, cucumber, zucchini, bell peppers, snow peas and string beans. oh my! for now, though, i've dedicated whatever spare time i can come up with today to catching up with blog reading. how was your weekend? are there any riveting must-read posts that i've missed? leave the link! Can't wait to see the veg! I haven't been garage saleing in a long time, but this weather is just too tempting not to, isn't it? A pic of just dirt isn't a bad thing! I had decided to do a "growing my garden" series on my blog but it's been so cold nothing is coming up yet. 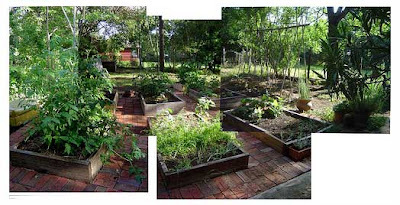 Look forward to seeing pics of your veggie garden! I am the queen of flea markets, but a bit freaked out by the idea of flea market hand sanitizer. Was it used? Or just cheap? Cheap would make sense. Garage saleing is fun even when you don't find anything. I love the thrill of the hunt! Ummmmmm, you totally forgot about going to see Terminator Salvation on Sunday night. Ooo, now I know what I'll be doing Saturday morning! I've been meaning to get out to garage sales and I'll have a free morning and it sounds delightful.